This is where my journey in the North West began. I left Nottingham by train in warm sunshine, and was met at Blackpool North Railway Station by showers. After 40 years of almost exclusive car journeys, I'm now getting used to train travel. There's just one change at Manchester Piccadilly (Manchester Oxford Road for the return journey), and the best part is undoubtedly between Sheffield and Manchester through the Peak District. 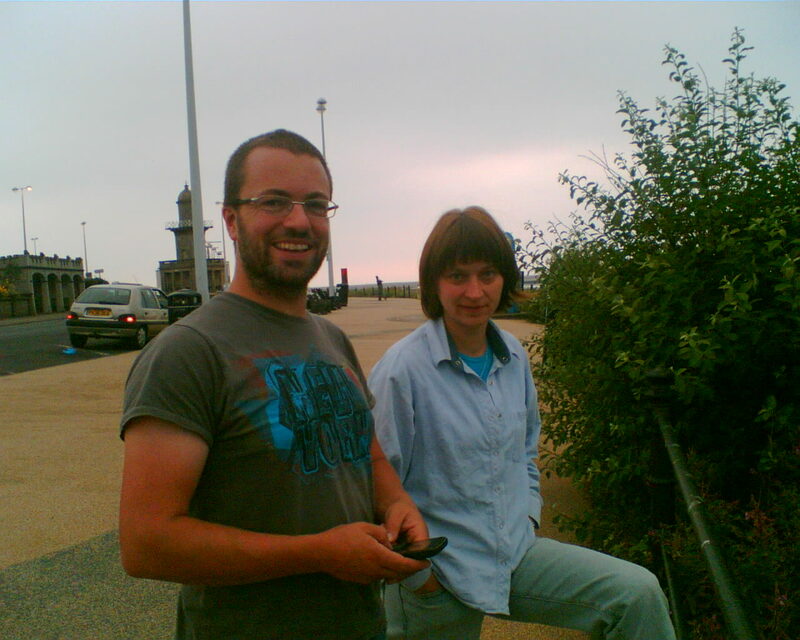 The purpose of my journey was to spend a few days in Cleveleys with my son and daughter in law, Roy & Aneta. I so enjoy being with them, and they very kindly support my non-activity based approach to having a break. When you see photographs from visits made by other members of both families, you see people climbing walls or cliffs, sailing on lakes or crawling down caves. Me, I'm terrified of heights, scared of water and petrified of underground. But I do like wandering about, and having lots of coffee and ice cream. Roy does not have to be forced to join me in this very hectic lifestyle of mine. We met up in Blackpool when I arrived, so that we could start the visit with a Costa and cake. I always think that is a very good way to start a holiday. For those who may not know, Cleveleys is situated on the Fylde Coast in Lancashire, between Blackpool and Fleetwood. It doesn't have the hustle and bustle of Blackpool, but nevertheless, it is quite a busy seaside place. My picture doesn't do justice to the newly completed (nearly) promenade, and I like it very much, though it could do with a little greenary, but perhaps that's on the cards. The area does go back to the Domesday Book of 1086, though it's original name was Ritherholme, which seems to have derived from the rivulet that flowed into the sea there. 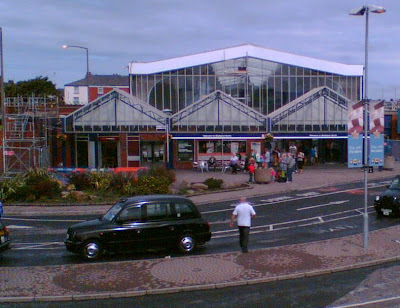 In the history section of the Cleveleys website, it gives a fascinating insight on how the sea has reclaimed so much land over the last few hundred years. It says, "Searching at low tide opposite Cleveleys for the sixteenth century village of Singleton Thorpe, an expedition in 1893 discovered the remains of a cobbled building with roof and wooden lintel. At that time, old boatmen could recall where a wall had existed nearly a mile from the shore". How different it must have all looked then. 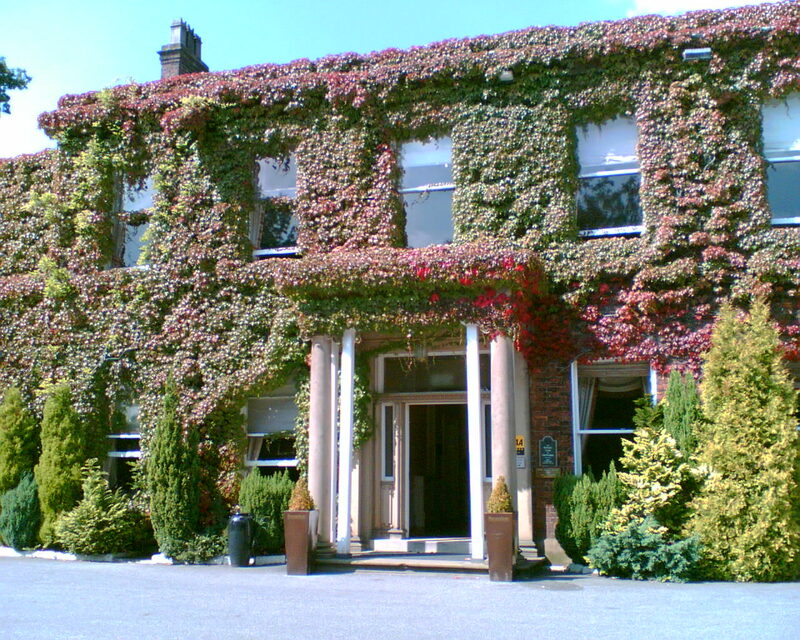 Last Saturday, while Roy was working, Aneta and I were taken out by a couple of their friends to have afternoon tea at Farington Lodge Hotel, on the outskirts of Preston. I don't think I've ever had a traditional English afternoon tea before, and if true, what have I been missing? It was wonderful, sitting in a comfortable lounge area, and eating lots of sandwiches (with the crusts cut off) and fancy cakes, looking out over a garden area. My clinging by a thread, austere Calvinistic philosophy quickly disappeared, and I could take this type of afternoon tea every day. Farington Lodge has an interesting history. It is a Four Star Grade 11 Listed Georgian house set in three acres of lawns and gardens, built in the 1830's as a family home for William Bashall, a partner in the prosperous Farington Cotton Mill. There were two more owners up to 1911, when until 1931, it was owned by the wealthy accountant James Todd and his family, who had offices in Blackpool, Chester, London, Manchester, Preston and Moscow. When James died in 1931, there was also a slump in the value of cotton shares in which much of his wealth was invested, and the family faced financial ruin. A family friend came to the rescue with a proposition. He was Henry Spurrier, the first managing director of Leyland Motors. He was looking for somewhere suitable for important visitors to Leyland Motors to stay, and he asked Mrs Todd if she would allow company guests to use some of the bedrooms, and for her to act as hostess, for which she would be paid. She agreed. When it was later known that Mrs Todd was looking to leave the area, Leyland Motors bought the property, and it became Leyland Motors Guest House and used primarily for visiting Directors and dignitaries. This lasted until 1989 when Leyland DAF became insolvent, and the present owners have been in charge since 1994. For those who can be bothered about such matters - and I do know that there are some royalists among you, guests have included Prince Edward and Mrs Simpson, The Queen Mother, Prince Philip, Princess Diana, and Princess Anne. Now doesn't that make the afternoon tea sound even better? I really enjoyed the afternoon, and the friends were great. On Sunday, Roy was not working, so the three of us went to look at Lytham Hall in Lytham (part of Lytham and St Anne's), and home to the British Open Golf Championship in 2012). 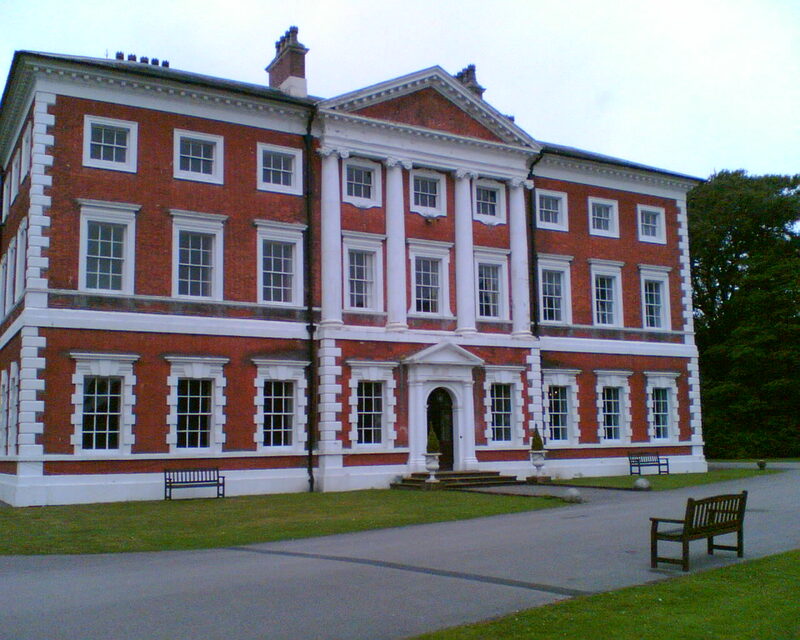 Lytham Hall is a Grade 1 Listed building, built between 1752 and 1764, set in 80 acres of lovely parkland. In fact, the earliest known building on the site was a 12th Century Benedictine Priory, and this remained until the Dissolution of the monasteries by Henry V111 in the 16th Century. We couldn't go in the house as there was only set times for tours, which was a shame, so we set off for a look around the grounds. The walk was very pleasant through the wooded areas and open grass land, and we decided to lie on the grass opposite the house and have a rest - these younger one's couldn't keep up with me, but I think that we all may have had a wee doze. We couldn't go an afternoon without tea/coffee and cakes, and we found the tea room. Very refreshing. While the tea room was now very modern, we took our refreshment out into the courtyard which was part of the original Jacobean Hall built in 1606 by Sir Cuthbert Clifton. 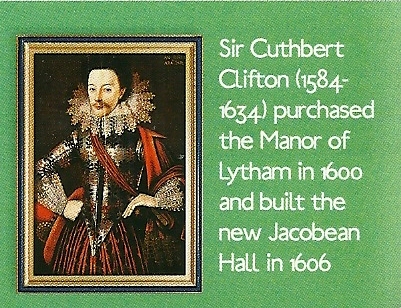 The Clifton family lived at the Manor until the 1960's, when it was sold to the Guardian Royal Exchange Insurance Group and used as their offices. It was sold to the Lytham Town Trust, a charitable organisation in 1997, and is managed by Heritage Trust for the North West. There are plans costing £5 million to restore the Georgian Hall, Jacobean Hall and Gardens to their former glory, as well as to make it fit for purpose in the 21st Century. While we were there, the leaflets were saying that they still needed to raise upwards of £3 million. However, as I started typing this blog, I noticed a news flash that said that the remaining money had been found, and that the work could go ahead, with a planned re-opening in Spring 2014. When this happens, "this hidden gem", which had been largely closed to the public for 400 years, will be open all the year round. I don't know why, but I'm so pleased to hear that news, and look forward to a visit in three years time. And the excitement didn't stop there. I was taken for a promised Father's Day meal at Fleetwood's 'crown jewel', the North Euston Hotel. This is a wonderful semi-circular building, built in 1841 to serve overnight guests making the rail journey from London Euston (hence the name, but you worked that out yourself, didn't you? ), and then on by Steamer to Scotland. Queen Victoria made that journey in 1847. Our table was by a window with a view over Morecambe Bay and the River Wyre estuary. I've spoken about serendipity before, and here was another example. As we ordered between 6.00 and 7.00pm, we were eligible for a three course meal for little more than the price of a main meal. Naturally, the three of us had a three course meal. Being a creature of habit, or totally predictable if you like, I had vegetable soup, beef, mushroom and Guinness pie, with Raspberry meringue to finish. I think that the pie was the best I've ever had. We all enjoyed the meal, and I was therefore very pleased with the treat. The hotel is now owned by a local family, who are "dedicated to bringing the hotel's facilities up to date without disturbing the charm of this stunning building". Fleetwood is no longer the port it once was, and is trying to get to grips with that fact. It is still the home of the Fisherman's Friend, those disgusting little black sweets so beloved by many. 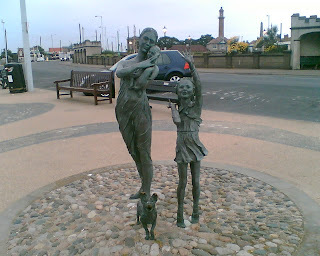 Fishing has of course dominated the history of Fleetwood, and the image opposite, designed and sculpted by Anita Lafford is a poignant reminder of those days. The plaque beside it says, "Welcome Home is erected as a tribute to the families of Fleetwood fishermen who have down the years shared the dangers and uncertainties of the industry. 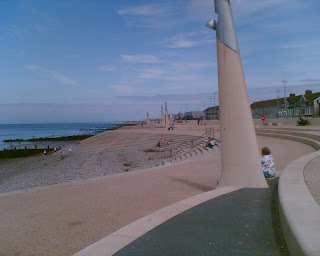 Around this spot families have gathered for generations to 'welcome home' their menfolk from the sea". I don't think that any further comment is needed, do you? My journey has taken in Cleveleys, Preston, Lytham and Fleetwood, and all in the space of a few days. I have loved being with my family - thank you for being there, and of getting to know new places. It has been fun on the Fylde coast.